Standard Songs for Average People in the top 30 for 13 weeks and the top 10 for 6 weeks on the Americana Chart! At Nashville's Station Inn, the mood was festive. A crowd had filled the legendary bluegrass club to help John Prine and Mac Wiseman celebrate the release of their album, Standard Songs for Average People, on Oh Boy Records. But as the sounds of revelry rose in the bar, the objects of this festivity joked and chatted on their own in the dressing room. "Mac," said Prine, taking a swig of bottled water, "I've never attended a release party. Do you know what we're supposed to do?" "Well, I haven't either," replied Wiseman. "But I think we just mingle with folks as they listen to the record. It appears they're gathering some sort of steam out there. I'm thinking about taking up a collection shortly." As the album pulsed through the sound system, Wiseman's sweet tenor and Prine's gravelly baritone intertwined through classics written by Tom T. Hall, Kris Kristofferson, Ernest Tubb, Bob Wills and other Country Music giants. Against this backdrop of timeless tunes and exuberant party guests, the two legendary writer/performers revealed how their ambitious collaboration came about. PRINE: "It all started a good seven years ago - and these days, when I say seven it's probably 10 or 12 - when I stopped in to see Cowboy Jack Clement. He said, 'Mac Wiseman was over the other day. Do you know Mac?' I said, 'Well, I'm a big fan, but I don't know him.' And Cowboy said, 'I mentioned your name and Mac likes your music. You guys ought to get together and record some songs.' I was amazed Mac even knew I existed, but when Cowboy says something, he's not just talking off the top of his hat. Then a couple of years ago, Fergy [David Ferguson, who engineered and co-produced Standard Songs for Average People] started up talking about it. He kept working at us both, until we got it together." WISEMAN: "We each agreed to draw up a list of 15 songs and then get together to make the final selection. Well, John came over to my house, and seven out of the 15 on our lists were duplicates. That seemed like an omen, you know? It meant we were on the same wavelength." What were some of the duplicates? WISEMAN: "'Death of Floyd Collins' was one, 'Pistol Packin' Mama' and maybe some Ernest Tubb songs, like 'Don't Be Ashamed of Your Age.'" PRINE: "Yeah, that was one we'd both picked out. A couple of songs on both our lists didn't make the record; I think 'Old Flames' was one. When we tried it, for some reason it didn't work out. Sometimes you have to find a couple of wrong songs to find the right one." WISEMAN: "'Old Dogs, Children and Watermelon Wine' was on both our lists, and that did make it. I was intimidated by it, I don't mind telling you. It is such a perfect record, both in arrangement and feel, I didn't know if I could add anything." PRINE: "Tom T. Hall's version is so set in stone, I don't think most people would even try to do it. But I knew if we both got into telling the story, it would work. Part of the song is narration, and part of it's like you're a character in it, which works great for two voices." WISEMAN: "John and I sat across a table from each other, and we'd sing through the songs on our list. We'd find out pretty quickly if one was going to work, and if it did, we'd cut the song with just four pieces to start with. It was Jamie Hartford on lead guitar - he was excellent with these songs - and the rhythm section [often including bassist Dave Jacques and drummer Kenny Malone]. That was it. We got a lot of first takes, which is always extra good. I didn't even play guitar, and John only played guitar on a couple of songs." [Guitarist Pat McLaughlin and pedal steel legend Lloyd Green also contributed]. Did you work out the arrangements ahead of time? WISEMAN: "No, we'd just try out a song right there with the band." PRINE: "They were sitting all around us, and everybody could see each other's eyes. The stuff the guys played pretty much determined the arrangements, plus Fergy had a few ideas to go this way or that. The band would start playing with me and Mac singing, and everybody just kind of ." WISEMAN: ". fell into it. I was amazed because many of these songs aren't easy to play." PRINE: "It's a good thing I didn't have to play them; I'd still be learning the chords to 'Old Cape Cod.' The song has nothing but diminished chords and those ones you hold five fingers on. For me, the Carol Lee Singers really made that song with their background vocals. It was a good version up until then, but when they got on it, man, it sounded like a record." WISEMAN: "They come from the old school, with that classic Nashville sound. We used to do songs with vocal groups here, like the Jordanaires and the Anita Kerr Singers, and Carol Lee has taken that style and developed it to such a degree. Being the daughter of Wilma Lee and Stoney Cooper, she heard this music from the day she was born." PRINE: "She comes up with a vocal arrangement so quickly, and she'll give you three or four different choices of sounds. She'll say, 'Do you want us singing the words, or do you want more of these oohs in there?' And then they'll all sing to illustrate the different ideas. For me, it was like having a full orchestra at our disposal all day long. We'd order in ribs and listen as they'd sing anything and everything we wanted to hear." The music has more of a relaxed, open and timeless quality than you hear on most modern albums. WISEMAN: "I'm glad to hear you say that, because really that was the feeling John and I had when we cut these songs." PRINE: "For a while we were calling ourselves 'the old Cape codgers.'" How did you divvy up the verses and choruses in each song? PRINE: "Trial and error, mostly, although the words are so good in some songs that one of us would want to jump in and claim a section. I knew what I wanted to sing on 'Saginaw Michigan' before we even got into it. When we did 'Old Dogs, Children and Watermelon Wine,' Mac got to sing, 'I was sittin' in Miami.' Man, I would have loved to have that line, but even more, I wanted to hear Mac sing it." WISEMAN: "Speaking of 'Saginaw Michigan,' we had fun with the modulations. John started off low, then I took it up to sing my lines, then we went back down for John to do an additional verse, and then back up a second time for me. You often hear modulations go up a step, but seldom down. Yet we did that twice, which is almost unheard of." As a songwriter, John, do you find it harder to record covers than your own songs? PRINE: "Oh, no, for me it's more gratifying to sing covers. See, I'm basically a big fan, and I love being in the studio when I'm enjoying myself, when it's not work. And it's not work at all when I'm singing covers. When it's something I've written, I worry the thing right up to the point where I finally get a recording I'm satisfied with. And even then sometimes I don't know whether it's done or not. But going in and singing your favorite songs, especially with Mac Wiseman, that is nothing but pleasure. If I could make records like that all the time, I'd be in the studio five days a week." WISEMAN: "This was a labor of love, except there wasn't any labor in it." "STANDARD SONGS FOR Average People," the title of the new album from John Prine and Mac Wiseman, is misleading on two counts. Although the 14 tracks include a few familiar hits (Lefty Frizzell's "Saginaw Michigan," Patti Page's "Old Cape Cod" and Leon Payne's "I Love You Because"), you couldn't describe obscurities such as Ernest Tubb's "Blue Eyed Elaine," Bing Crosby's "Where the Blue of the Night" or Kris Kristofferson's "Just the Other Side of Nowhere" as standards. Nor could you call Prine and Wiseman average people. Prine is one of the best songwriters of his baby-boomer generation, while Wiseman helped pioneer bluegrass in the preceding generation. These two eccentrics are an unlikely pair singing an unlikely repertoire, but the album is a delight nonetheless. Part of that is because of the terrific string-band musicians; "Cowboy" Jack Clement, Tim O'Brien, Ronnie McCoury, Stuart Duncan and more back the singers with graceful restraint. Even more key to the album's success are the two contrasting voices of Wiseman and Prine. Wiseman, 82, still has a honeyed tenor that gives itself so readily to the songs that it often verges on sentimentality. Prine, 60, has a small, scratchy voice that approaches the songs warily, as if suspicious of sentiment. Whether they're chuckling their way through Bob Wills's "Don't Be Ashamed of Your Age" or soberly singing the hymn "Old Rugged Cross," the sensual pleasure of Wiseman's vocals and the skeptical intelligence of Prine's push and pull at each other to create a fascinating drama. Every now and then a country CD comes along that knocks my socks off. This one by John Prine and Mac Wiseman is right up my alley. With songs like Old Cape Cod, The Old Rugged Cross and I Come to the Garden Alone, just to name a few, you're sure to find a feeling tone that suits you. It's authentic country and gospel at its best with a twang. And I, being an average person, love these standard songs. Get it and then enjoy country music the way it's meant to be. And thanks 2E, my northern citygirl friend for introducing me to this one, even though I should have been the one to introduce you.......a bit embarrassing for a southern, country girl to be shown up by a Yankee, of all things......humbled again. John Prine and Mac Wiseman are as different as charcoal and diamonds: Prine’s jagged voice suggests the acoustic storytellers of his generation who used personality and phrasing to give their tales color. Wiseman, a bluegrass pioneer, is the Sinatra of mountain music -- a smooth and adventurous crooner whose smooth tone rides atop mandolins and fiddles like billowy clouds skimming tall pines and deep hollows. On their new album of duets, “Standard Songs for Average People,” these two music vets don’t harmonize as much as bring out the other’s distinctive vocal strengths. They’re more likely to trade lines than join together, but they sound delighted either way. This isn’t a duo set up as a star-trippin’ venture, nor is it meant as an artistic exercise to stretch their talents. It simply sounds like two well-traveled guys -— Prine is 60, Wiseman, 81 -— sharing a love of old songs and feeling inspired by each other’s company. In that sense, the album shares a lighthearted outlook with the recent album by Merle Haggard, Willie Nelson and Ray Price, “Last of the Breed,” or, for that matter, Jerry Lee Lewis’ duets album with various veterans, “Last Man Standing.” Maybe it’s a reaction to our turbulent times that these masters want to trade lines on buoyant songs that celebrate endearing aspects of love and life. Or maybe, when old guys sing together, it’s just more natural to put across a sunny lyric. Interestingly enough, the serious moments occur when Prine and Wiseman bow their heads on two contemplative hymns, “In the Garden” and “The Old Rugged Cross.” Otherwise, the two gents sound like they’re smiling throughout. They even give a jug-band treatment to “Pistol Packin’ Mama,” the album’s standout track. In it, Wiseman gives a doctorate lesson in how to vary phrasing in each stanza to give a song more flavor, while Prine sings his lines as if having the time of his life. The top session players add a variety of instrumentation and background vocals to the mostly slower tempo’ed repertoire. Acoustic stringed instruments sit nicely with piano, organ, electric guitar, pedal steel, harmonica, accordion and drums to create a sound reminiscent of the 1950s. The accompanists include Tim O’Brien, Stuart Duncan, Kenny Malone, Charles Cochran, Lloyd Green, Dave Jacques, Ronnie McCoury, Joey Miskulin and others. Jack Clement plays Dobro or rhythm guitar on five tracks. The musical mood from yesteryear is most apparent on those seven tracks that incorporate the Carol Lee Singers’ background vocals in a style of that era. Mac and John often trade off singing verses, and they even sing a few phrases in unison (a slight distraction). Mac and John may be getting up in their years. Mac’s in his 80s now. John was diagnosed in 1998 with throat cancer, and he’s undergone surgery to deal with that. There’s a lot of cautionary insight in the old country songs like “Pistol Packin’ Mama.” However, as they sing in “Don’t be Ashamed of Your Age,” Mac and John remind us of an essential tenet in their lives - “Life ain’t begun until you’re 40, son. That’s when you really start to go to town.” This album is proof that little is slowing these two energetic legends down. IN all my years of broadcasting I can honestly say that I've had more requests for John Prine than any other country music artist. After nearly a decade of McLean's Country, the roots and country music show I present every Friday night on BBC Radio Ulster, I must have played the postman-turned-singer/songwriter hundreds of times. I gave up counting a long time ago. I'm not exaggerating when I say that barely a day goes by without another heartfelt email or letter arriving in my inbox or the BBC post room singing the man's praises and asking for some obscure track or other. His popularity in these parts puts the likes of Johnny Cash and Merle Haggard to shame, and while he may not sell like some of his better-known colleagues in the country music field, there's no denying that this man has a cult following that most artists would kill for. It's been a long career and the great man isn't getting any younger, but there's just something in his songwriting that clearly touches a nerve with Northern Ireland audiences. For my money, it's the honesty and believability of his work that really hits home. We like a good story, told with passion and bare-boned simplicity in these parts and Prine's art ticks all those boxes and then some. Early classics like his harrowing tale of post Vietnam addiction, Sam Stone, still score high with listeners when it comes to picking favourite tracks, but nearly everything old JP has done since he started recording in the early seventies is worth checking out. His latest release, Standard Songs For Average People, is a perfect example. Freshly offered up on his own Oh Boy record label, it's a duet album with legendary bluegrass figure Mac Wiseman and it oozes class from every single track. This is the way all country albums should be recorded. There's no fat, no needless noodling and the playing and singing are of the highest order from the very first note. Short, sharp songs from the great American songbook are delivered with the kind of down home charm and ease that only comes from decades of shared experience. Hearing the Illinois voice of Prine sparring with the ageless croon of Virginian Wiseman is beautiful and while those fans looking for great JP originals may be left feeling ever so slightly short-changed, the rest of us can just wallow in one of the best and most traditional country albums of the year so far. Wiseman is in his 80s now and Prine's voice is undoubtedly showing the signs of damage brought on by illness in recent years, so it's not surprising that most of the songs on offer here trot along steadily rather than racing away, but that's no big problem. With two performers this good, tackling songs as great as I Love You Because and Death Of Floyd Collins and clearly loving every single minute of it, it's a pleasure from start to finish.
? Hear Ralph on Radio Ulster Monday-Friday from 8-10pm. The most impressive thing about Standard Songs for Average People is how comfortable and unforced the whole proceeding sounds. When the pair got together to record at Cowboy Jack Clement’s Cowboy Arms Hotel in Nashville, producer David Ferguson set up the studio so that Prine and Wiseman were able to sit across from each other at an old dining room table. The music that results from this arrangement is brimming with confidence, and it is so unhurried that it is hard to remember that Prine and Wiseman had never met before the album was committed to tape. From start to finish, the collection feels more like a fly-on-the-wall document of an impromptu meeting of dear, old friends than a date that was arranged by a musical matchmaker. The first time John Prine visited Ireland, he got lost in the lonesome mountain fog. But the Maywood-born singer-songwriter always packs his favorite music, and Malcolm "Mac" Wiseman -- a legend who recorded with Bill Monroe and co-founded the Foggy Mountain Boys with Lester Flatt and Earl Scruggs -- is one of his favorite artists. "I gave the driving over to Fiona, who wasn't my wife yet," Prine recalled during a recent conference call with Wiseman. "She was after that trip." (Wiseman broke in with a laugh.) "It was 2 in the morning, and we couldn't see our hand in front of our face. We put on Mac Wiseman, and he guided us out of the fog." Wiseman chuckled and said, "Get us out of here -- that's what it did!" Prine said, "You sang us off the mountain, Mac." In a historic collaboration, Prine and Wiseman have released "Standard Songs for Average People," where they duet on American classics such as Lefty Frizzell's "Saginaw, Michigan," Patti Page's "Old Cape Cod," and ringers like Cindy Walker's "Don't Be Ashamed of Your Age," popularized by Bob Wills. Wiseman's smooth tenor connects with Prine like butter on wry bread. "Standard Songs for Average People" was recorded three years ago in David Ferguson's basement studio in the semi-renovated Neuhoff meat packing plant in Nashville. Ferguson was the latter-day engineer for Johnny Cash. "Mac and I were equally surprised how well our voices went back and forth," Prine explained. "It was all very relaxed as opposed to when I did the duets record [1999's "In Spite of Ourselves"] with the different girls [Lucinda Williams, Iris DeMent and others]. Like Patty Loveless and Lucinda would be outside while I was recording with Trisha Yearwood. I was under the gun, but I took my time with each one. Mac and I were just sitting across the table. It was the easiest record I ever made, easy as far as being just plain fun." Wiseman added, "I was fascinated by our compatibility. For example, Ray Price and [Merle] Haggard make records [like their new "Last of the Breed" collaboration with Willie Nelson], but they have such individual styles that it is almost startling when voices change. To me, that's not a plus, because subliminally you find yourself getting used to the different voice and it deters from attention to the record. On this record, despite our individual styling, on some of these songs you have to listen carefully to hear when we swap." Several years ago, Nashville musician-producer and former Sun Records engineer "Cowboy" Jack Clement suggested the Wiseman collaboration to Prine. Clement also introduced Prine to Wiseman's 1969 novelty hit "If I Had Johnny's Cash and Charley's Pride" by singing it to Prine as they drove around Music City. Prine had never met Wiseman until the project began. Wiseman is friends with Kris Kristofferson, who always has championed Prine. Wiseman was introduced to Prine's music through "Paradise," Prine's 1971 song about his father's vanishing Kentucky coal country. On the flip side, Prine liked Wiseman's uptempo version of "Love Letters in the Sand," cut two years before Pat Boone's 1957 No. 1 hit version. Wiseman and Boone both recorded for Dot Records in the late 1950s. Once the collaboration was in motion, Prine suggested each singer compile a list of songs he would like to record. There was no limitation on style or time period. Prine said, "Fergie [David Ferguson] definitely made sure it happened. He had one track ready for us. It was the Kristofferson song ["Just the Other Side of Nowhere"]." Ferguson played them the track. He asked them to sing on it, and Prine and Wiseman's voices immediately clicked. Wiseman grew up in the Shenandoah Valley of Virginia reeling in the Grand Ole Opry and the WLS Barn Dance out of Chicago on a battery powered radio. He suffered from polio as a child that resulted in a limp leg he still has today. Wiseman received a scholarship from the National Polio Foundation and attended the Conservatory of Music in Dayton, Va., where he studied music theory, radio and piano. In 1946, Wiseman was hired by mountain singer Molly O'Day, and he came to Chicago to play bass with her Cumberland Mountain Folks on her first recordings for Columbia Records. O'Day was best known for her torrid gospel version of "Tramp on the Street." "I sunburned the roof of my mouth staring up at the buildings in Chicago," said Wiseman, a former radio disc jockey in Bristol, Va. "I was a country boy, and it was such a thrill. We were recording on acetates, and Molly was a nervous wreck on the first couple of songs. She was afraid she would make a mistake and ruin the disc." Prine asked Wiseman if he remembered where the studio was. "It seems like it was in a hotel," Wiseman said. "We were staying in the same place because we'd go to the dining room for meals. In addition to the session, the trip to Chicago was magnificent. We drove to Chicago in one of the first cars made after the Second World War. It was a stretch DeSoto with a rack on top. ... We stopped in Renfro Valley [Ky.] and spent a day there. They were having a turkey shoot, but they weren't shooting targets. They were shooting live turkeys. It was Thanksgiving, 1946." Prine said, "That would make me one month old." Wiseman laughed and asked, "Why didn't you come down to the studio?" Prine said, "My mother wouldn't let me!" Even in a 40-minute conversation the kindred spirit between Prine and Wiseman becomes clear. Sometimes such emotional intangibles can seal the recording deal. Prine also had it with the late Steve Goodman. Prine said, "For the first time, I felt like the microphone was friendly. I used to go into the studio and play, and I couldn't wait to get out. One of the hardest things for me was getting used to the sound of my voice. I knew I was singing from the bottom of my feet" -- again, Wiseman laughed -- "but it was another thing to hear it come back at me. But with Mac I loved to listen to the playbacks." Wiseman added, "Of the 600-plus songs I've recorded, this was the most enjoyable project I've done. Not that I was having a pity party, but at my age it crossed my mind occasionally that I had my day. But this gave me renewed confidence. John, I don't mind saying it, 'I'm tagging along, buddy.' "
John Prine just sounds like a nice guy. You can almost hear the side of his mouth curl into a grin as he finishes a line, even on a sad little waltz like “The Blue Side Of Lonesome.” He’s also not a “singer’s singer,” he doesn’t belt it out and wow you with his pipes. But for most of us that’s another reason to love the guy, because what he does with what he’s got is always so satisfying and genuine. Joined here by bluegrass troubadour Mac Wiseman, Standard Songs For Average People collects 14 songs, some well known and some not, for these two remarkable singer/songwriters to interpret however they see fit. You get anything from the brushed snare and tinkling piano nostalgia of “Old Cape Cod” to the world-weary storytelling of “Old Dogs, Children and Watermelon Wine,” both endowed with gorgeous backups from the Carol Lee Singers. You’re also afforded the opportunity to hear these two artists having fun with each other, trading verses with an almost conversational quality that masks some of the fact that this is a studio recording, not an impromptu songwriter’s jam among friends. The acoustic guitars are warm and woody, the vocals sweet, and the arrangements impeccable in their simplicity. It can’t hurt to have a virtual laundry list of fine players contributing to the project, with Tim O’Brien on banjo and mandolin, Del McCoury bassist Mike Bub and multi-instrumentalist/session man extraordinaire Pat McLaughlin on just about everything else with a string on it. Swinging, two-stepping and tear-in-the-beering its way through just over an hour, Standard Songs For Average People is just the right thing for when you’re just a little blue, and these guys are just such characters on the microphone that it’s hard not to crack a smile after a while. This is an album that draws from many traditional American country sounds, from the mountains way down to Texas. Add to that the caliber of musicians delivering the material, and all you’ve left to do is cue up “Saginaw, Michigan” and turn the volume in a general “up” type direction. Hearing John Prine and Mac Wiseman sing together is like having a front row seat to the yin and yang of today's Grand Ole Opry. Prine grew up in Chicago and came of age in the counterculture protests of the 1960s, while Wiseman spent his youth listening to the Opry on his family's farm in Virginia's Shenandoah Valley. On "Standard Songs for Average People" (Oh Boy), Prine, 60, and Wiseman, 80, blend their voices on 14 country and pop antiques. Their first collaboration makes them sound like old friends enjoying a back porch song swap. Dubbed "The Voice with a Heart," Wiseman's warm, smooth tenor is the perfect complement to Prine's raspy, intimate growl. They open in the 1940s with Ernest Tubb's "Blue-Eyed Elaine," a perky ode to romance inspired by Jimmie Rodgers. With the Bob Wills/Cindy Walker nugget "Don't Be Ashamed of Your Age," they seem to offer their own philosophy on life's golden years. It's easy to picture them smiling as they trade leads and harmony on such classics as Lefty Frizzell's "Saginaw Michigan," Al Dexter's "Pistol Packin' Mama," and Tom T. Hall's enduring story song "Old Dogs, Children and Watermelon Wine," backed by the "Nashville sound" chorus of the Carol Lee Singers. The gospel gems "In the Garden" and "Old Rugged Cross," along with Patty Page's "Old Cape Cod" and Bing Crosby's "Where the Blue of the Night," round out this labor of love from two above-average icons whose songs have become standards for their respective generations. It's a modest title, ain't it? Standard Songs for Average People. It's quiet, unassuming, and makes no pretension about its worth or importance. It's also a title that's equal parts accurate and misleading; Standard Songs is such a beautiful, worthy album that it deserves a far less reserved title, and yet it's so comfortable, mellow, and soothing that its title fits. I'll admit upfront that I had never heard of Mac Wiseman prior to this record; I guess living in the UK means the Bluesgrass hero has been off my radar. That said, up until I saw him live back in 2005, I was unaware of John Prine too. Ignorant fool that I am! Since seeing him on stage, it's fair to say I've adored Prine's work. He's a great lyricist, and has a unique charisma as a performer. You won't find any of Prine's lyrics on this album though; it's a compilation of covers performed by Prine and Wiseman, backed by a great set of musicians. The Opry's Carol Lee Singers also appear on half of the album's tracks, with a sound that reminds me of The Carter Family's backing work with the late Johnny Cash. Much of the album has that sort of feel to it; somehow feeling old-fashioned, yet clearly a recent piece of work - oddly timeless. It's a magical soundscape. Songs covered range from Kris Kristofferson's "Just the Other Side of Nowhere" (a personal favourite of mine), to "Old Cape Cod", "Old Rugged Cross", and the album's opener "Blue Eyed Elaine". The voices of Prine and Wiseman sound old and experienced, yet not in a gruff over-the-hill kind of way. They sound hopeful, content, and at peace. It's blissful. There's much fun to be had too: "Don't Be Ashamed of Your Age", "Pistol Packin' Mama", and "Saginaw Michigan" - a track Prine performed when I saw him, the inclusion of which makes me a very happy man - will all put a smile on your face, just as certainly as the performers had a smile when they recorded it, I'd wager. The beauty of this album is the range of emotions covered: aside from the fun, tracks like "Old Dogs, Children, and Watermelon Wine" have a sense of melancholy to them, while "Old Rugged Cross" keeps its chin up and tries to be hopeful in the face of adversity. You can almost picture Prine and Wiseman recording this, or at least settling down to decide what to record. Despite an age difference of over twenty years, they seem to have a genuine chemistry and compatibility that enriches each song on the album. And despite the fact that Prine is twenty years Wiseman's younger, his voice is such a well worn instrument (perhaps in no small part due to the throat cancer surgery he experienced in 1998) that there's nothing but a sense of equality amongst the two of them. They're just two old dudes putting the world to rights, reminiscing, and having a little fun. In short: I adore this album. It travels across a range of emotion and sentiment, is never anything other than a splendid joy musically, and sticks with you long after you've finished listening to it. Over at Mac Wiseman's house, it's mostly smiles and stories when John Prine comes over. The men — Wiseman, an 81-year-old acoustic music giant with a sonorous voice that lands him as some kind of bluegrass Sinatra, and Prine, a 50-year-old singer-songwriter with a singing voice that sounds like sandpaper rubbed against a cowboy boot but manages to land pillow-soft on listeners' ears — are music buddies. Longtime mutual admirers, they've just released an album called Standard Songs for Average People, on which they cover source material from Tom T. Hall to Bing Crosby. And on the album, it's mostly smiles and stories. "For a while, the title was going to be God, Beer, Loneliness, Isolation, Love and Watermelon Wine: Tales From the Two-Headed Sweater," Prine said, pulling out a piece of paper with a roughly mocked-up album cover to prove he wasn't just spouting nonsense. Prine and Wiseman laugh a lot, but they aren't much into spouting nonsense. And they aren't so much into being interviewed. Trying to engage these two once they get to talking is like trying to interview some Olympic hurdler once he gets to hurdling. So the talk moves from Crosby and Hall to the guy who sang harmonies for Ray Price, to the Carter Family and over to Jimmie Rodgers, the famed "Singing Brakeman" who could yodel better than most people can walk. "I can't yodel a bit, and that's what intimidated me about Rodgers," Wiseman said, to which Prine replied, "I can yodel just like playing harmonica; I have to be really drunk, and it has to be about 4:30 in the morning. Sometimes I have to be alone, and sometimes I don't care if there's anybody around or not." Wiseman shook his head. "Well, I could never drink enough to get a yodel going." After awhile, Prine faces his would-be inquisitor. "In answer to your question that you haven't asked yet, 'Yeah, it was an easy record to make.' We just had to stop talking long enough to sing." Old friends brought the two together to sing . . . and to talk. Cowboy Jack Clement and David Ferguson, two soundboard masters who aren't any slouches themselves in the raconteur department, kept telling Prine and Wiseman that they should record something together. Finally, Ferguson recorded basic tracks for a song, invited Prine to come by the studio to sing on it and told Wiseman, "John Prine said if you don't come down Thursday he's gonna kick your (posterior)." "I thought, 'Well, I better take him up on that,' " Wiseman said, laughing. "I went down on that Thursday, just thinking we were going to visit." When the men got together to sing, they were pleased with the way their voices blended. On the completed album, sometimes it's even hard to tell where one stops and the other begins. Turns out sandpaper and Sinatra mix just fine. Wiseman's is known as "The Voice With the Heart," Prine has always had a little grin tucked down in his voice, and the men's song sensibilities are remarkably similar. Before they started recording, they made separate lists of 15 songs they'd like to sing together. When they sat at Wiseman's house and unveiled their separate lists, seven of the 15 songs were matches. And so it came to be that the wily song craftsman and the man former boss Bill Monroe once called "the strongest singer I ever had" got together and recorded Kris Kristofferson's "Just the Other Side of Nowhere," the New England crooner classic "Old Cape Cod," gospel numbers "In the Garden" and "Old Rugged Cross," Hall's "Old Dogs, Children and Watermelon Wine" and a bunch of others. Prine insisted on doing the Hall song, because he wanted to hear Wiseman sing "I was sitting in Miami, pouring blended whiskey down." Both Prine and Wiseman were keen to do a Bing Crosby song: They chose "Where the Blue of the Night (Meets the Gold of the Day)." "The first day I met you, we weren't talking for a half-hour before Bing Crosby came up," Prine said to Wiseman. "Second time we talked, a reference to Bing Crosby comes up. I thought, 'That's odd,' because your voice kind of reminds me sometimes of Bing Crosby. Your voice is like an ice skater; it sounds like it's skating right across the pond, regardless of the music sitting right behind it." Then talk moved back to the Carter Family, and, as usual, Prine's remembrances as a fan led to Wiseman's firsthand stories. "I learned to play the guitar off of old Carter Family records," Prine said, and Wiseman responded, "Well, I had the extreme pleasure of knowing the old man, A.P. Carter. See, I was in Bristol in 1947 when we . . ."
Once completed, that story led to another and another. The men were on a couch, less than 10 yards from an 84-year-old kitchen table, the same one where Wiseman sat and learned to strum a guitar as a young man. That seems a long, long time ago, yet music tends to bridge the decades. "Oh, I knew old Ralph Peer, too," Wiseman said. "When we started the Country Music Association he was around and he was very supportive. Ralph Peer was . . ."
There's no shortage of new albums loaded with old country songs, whether it's Willie Nelson's take on Cindy Walker classics (You Don't Know Me) or David Ball's recent Heartaches by the Number. This album of duets by iconoclastic folkie John Prine and bluegrass hero Mac Wiseman tackles the familiar material with the advantage of coming from outside country's often narrowly defined borders. For that reason, there's a unique twist to these covers, even though they are delivered with a traditional approach. Some of the choices are inspired, too, such as the opening "Blue Eyed Elaine," an Ernest Tubb song that's not been done to death. Introduced by Prine's distinctive, syrupy tenor, the bouncy tune also showcases a fine studio band including pedal steel icon Lloyd Green. Green also shines on Cindy Walker's "Don't Be Ashamed of Your Age," which features tasty fiddle by Stuart Duncan and playful accordion by Joey Miskulin. Above the frisky accompaniment, Prine and Wiseman sound perfectly suited to the notion of growing old gracefully. The two singers balance light-hearted ditties such as "Saginaw, Michigan" and "Pistol Packin' Mama," with slower sentimental tunes such as Tom T. Hall's "Old Dogs, Children and Watermelon Wine." A handful of old hymns are pretty, too, if less interesting at points. Yet the goal of this album isn't reinvention, as much as it is to lovingly recreate these old favorites. On that score, Prine and Wiseman handle these standards with skill that's above average. Listening to John Prine and Mac Wiseman's new album Standard Songs for Average People (released April 24th on Oh Boy Records), it's nearly impossible to believe that these two giants of American music had never met before these historic recording sessions. Prine is a songwriting legend from the suburbs of Chicago and a star of counter-culture country and Americana. Mac Wiseman, raised on a farm in the Shenandoah Valley, is one of the framers of the bluegrass constitution and one of the most artful song interpreters in country music history. They are separated by 21 years, a full generation. And yet to hear their voices twine together on this set of deftly-chosen songs, one is struck by a deep and moving kinship, an empathy that goes beyond mere collaboration. The list included the Lefty Frizzell hit “Saginaw Michigan,” the old ballad “The Death of Floyd Collins,” and Tom T. Hall's poignant “Old Dogs, Children and Watermelon Wine.” Some come from Prine and Wiseman's childhoods, like “Where The Blue of the Night,” which Mac vividly remembers hearing on the radio when he was a boy, courtesy of Bing Crosby. Some were overlooked in their day. Others had great success only to fade from our collective memory. “Blue Eyed Elaine,” the kick-off tune, was cut by Ernest Tubb in the 1940s, but it never charted. Whereas “I Love You Because” garnered top ten hits for songwriter Leon Payne, Tubb, and Clyde Moody all in one year (1950). It returned as a hit ten years later for Johnny Cash, 20 years later for Carl Smith and 25 years later for Jim Reeves. Yet you'll rarely if ever hear it on classic country stations. Prine says one of his favorite songs here is “Old Cape Cod,” a Patti Page hit in 1957 and one of several tracks here that features the Grand Ole Opry's Carol Lee Singers fleshing out the recording with Jacuzzi-warm background vocals. Prine and Wiseman also chose an under-exposed song from Kris Kristofferson, “Just The Other Side of Nowhere.” It never became a hit when covered by Cash, Bobby Bare, Dean Martin or Dottie West, but it should have been. John Prine has proven himself as a collaborator and interpreter before. His 1999 duets album In Spite of Ourselves earned a Grammy nomination. 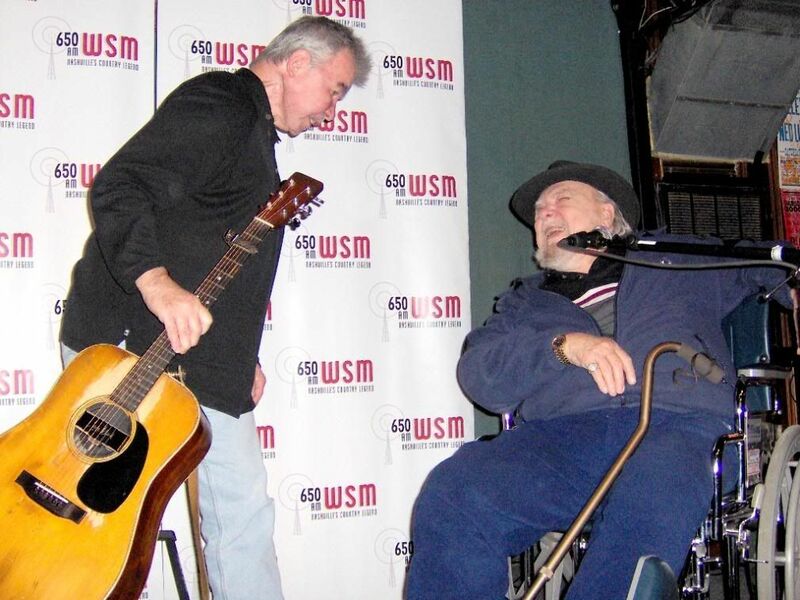 Wiseman has matched voices with Bill Monroe, Lester Flatt, Molly O'Day and many other greats. Thus it's little surprise that the two men sing together as easily as Fred and Ginger spinning across a soundstage. What's amazing is that Wiseman has said that of the 600-plus sides he's recorded in his career, this was “by far the most gratifying experience I've ever had in the studio.” Asked why, he chose two words: “sincerity” and “compatibility.” One need look no further for adjectives to describe this album. The singers recorded the tracks facing each other across a dining room table set up in a basement studio near Nashville's atmospheric and semi-renovated Neuhoff meat packing plant. Co-producer and engineer David Ferguson (Johnny Cash) assembled an extraordinary group of sidemen, including guitarists Pat McLaughlin and Jamie Hartford, drummer Kenny Malone, bassist Dave Jacques and pedal steel legend Lloyd Green. Two consummate musical masters join forces on a fine program of classic country that also dips into Western swing, gospel and folk. The selections present their spicy adaptations of anthems penned by Bob Wills (“Don’t Be Ashamed Of Your Age”), Al Dexter (“Pistol Packin’ Mama”), Tom T. Hall (“Old Dogs, Children and Watermelon Wine”) and Kris Kristofferson (“Just The Old Side of Nowhere.”) Prine and Wiseman’s elaborations, twists, slants and treatments provide the ideal combination of confidence, humor, suggestiveness and saltiness, though they’re also able to become appropriately reverential on the “Old Rugged Cross” (nice arrangement by Prine) or Irene Spain and Andrew Jenkins’ “Death of Floyd Collins.” Steel guitar maestro Lloyd Green, fiddler Stuart Duncan, multi-instrumentalist Pat McLaughlin and the great Jack Clement are among numerous all-star guests who make Standard Songs for Average People a special collaboration. As male singers go, John Prine and Mac Wiseman are as different as charcoal and crystal. Prine’s jagged voice evokes the acoustic storytellers of his generation who used personality and phrasing to give their tales color. Wiseman, a bluegrass pioneer, is the Frank Sinatra of mountain music, a smooth and adventurous crooner whose mellifluous tone rides atop mandolins and fiddles like cirrus clouds skimming tall pines and deep hollows. On their new album of duets, Standard Songs for Average People, these two veterans don’t harmonize as much as bring out the other’s distinctive vocal strengths. They’re more apt to trade lines than join together, but they sound delighted either way. This isn’t a duo set up as a star-power venture, nor is it meant as an artistic exercise to stretch their talents. It simply sounds like two well-traveled guys—Prine is 60, Wiseman, 81—sharing a love of old songs and feeling inspired by each other’s company. STANDARD SONGS FOR AVERAGE PEOPLE John Prine and Mac Wiseman (Oh Boy Records) The 14-song collection is co-produced by John Prine and David Ferguson (a longtime co-hort of Jack Clement, who suggested the two singers unite), and the arrangements wrap these divergent voices in artful parlor music. Drummer Kenny Malone and Bassist Dave Jacques provide a lovingly subtle pulse, and the producers weave in guest players around a core band of Charles Cochran on piano, Lloyd Green on steel and Pat McLaughlin on mandolin and acoustic guitar. Frequent guests include Stuart Duncan on fiddle, Jamie Hartford on electric guitar, The Carol Lee Singers on harmony, Ronnie McCoury on acoustic guitar and mandolin, Joey Miskulin on accordion and Tim O’Brien on acoustic guitar. In that sense, the album shares a lighthearted outlook with the recent album by Merle Haggard, Willie Nelson and Ray Price, Last of the Breed, or, for that matter, Jerry Lee Lewis’ duets album with various veterans, Last Man Standing. Maybe it’s a reaction to our turbulent times that these masters want to trade lines on buoyant songs that celebrate endearing aspects of love and life. Or maybe, when old guys sing together, it’s just more natural to put across a sunny lyric—pain, disappointment and disdain are better saved for the intimacy of a solo performance. Interestingly enough, the serious moments occur when Prine and Wiseman bow their heads on two contemplative hymns, “In the Garden” and “Old Rugged Cross.” Otherwise, the two gents sound like they’re smiling throughout. They even give a ribald, jug-band treatment to “Pistol Packin’ Mama,” about a woman looking to gun down her good-timing man—and it’s the album’s standout track. In it, Wiseman gives a doctorate lesson in how to vary phrasing in each stanza to give a song more flavor, while Prine sings his lines as if having the time of his life. Meanwhile, McCoury and O‘Brien show just how virtuosic string players can get on a playfully rocking tune. At this point, Prine and Wiseman have earned a right to lighten up and have a little fun. Give into the album’s charms, and it’ll have the same effect on you. Listening to Mac Wiseman and John Prine’s new album “Standard Songs for Average People,” it’s nearly impossible to believe that these two giants of American music had never met before these historic recording sessions. The list included the Lefty Frizzell hit “Saginaw Michigan,” the old ballad “The Death of Floyd Collins,” and Tom T. Hall’s poignant “Old Dogs, Children and Watermelon Wine.” Some come from Prine and Wiseman’s childhoods, like “Where The Blue of the Night,” which Mac vividly remembers hearing on the radio when he was a boy, courtesy of Bing Crosby. Some were overlooked in their day. Others had great success only to fade from our collective memory. “Blue Eyed Elaine,” the kick-off tune, was cut by Ernest Tubb in the 1940s, but it never charted. Whereas “I Love You Because” garnered top ten hits for songwriter Leon Payne, Tubb, and Clyde Moody all in one year (1950). It returned as a hit ten years later for Johnny Cash, 20 years later for Carl Smith and 25 years later for Jim Reeves. Yet you’ll rarely if ever hear it on classic country stations. Prine says one of his favorite songs here is “Old Cape Cod,” a Patti Page hit in 1957 and one of several tracks here that features the Grand Ole Opry’s Carol Lee Singers fleshing out the recording with Jacuzzi-warm background vocals. Prine and Wiseman also chose an under-exposed song from Kris Kristofferson, “Just The Other Side of Nowhere.” It never became a hit when covered by Cash, Bobby Bare, Dean Martin or Dottie West, but it should have been. John Prine has proven himself as a collaborator and interpreter before. His 1999 duets album In Spite of Ourselves earned a Grammy nomination. Wiseman has matched voices with Bill Monroe, Lester Flatt, Molly O’Day and many other greats. Thus it’s little surprise that the two men sing together as easily as Fred and Ginger spinning across a soundstage. What’s amazing is that Wiseman has said that of the 600-plus sides he’s recorded in his career, this was “by far the most gratifying experience I’ve ever had in the studio.” Asked why, he chose two words: “sincerity” and “compatibility.” One need look no further for adjectives to describe this album. The singers recorded the tracks facing each other across a dining room table set up in a basement studio near Nashville’s atmospheric and semi-renovated Neuhoff meat packing plant. Co-producer and engineer David Ferguson (Johnny Cash) assembled an extraordinary group of sidemen, including guitarists Pat McLaughlin and Jamie Hartford, drummer Kenny Malone, bassist Dave Jacques and pedal steel legend Lloyd Green. This April 24 release, a treasure for fans of classic songs, is a friendly collaboration between legendary songwriter John Prine and bluegrass titan Mac Wiseman. Songwriter/producer Cowboy Jack Clement of Sun Records fame suggested that Prine sing with Wiseman several years ago, and Prine eventually contacted Wiseman to talk about music. These talks led to them each making a list of songs they'd like to record with no restrictions on style, genre and age. They decided to make a full-on duets album from there. A ton of great American music is featured here, including Elvis' Sun chestnut, "I Forgot to Remember to Forget," Tom T. Hall's beloved "Old Dogs, Children and Watermelon Wine" and classic gospel songs "In the Garden" and "The Old Rugged Cross." The sympathetic backing by keyboardist Charles Cochran, bassist Dave Jacques, drummer Kenny Malone, pedal steel master Lloyd Green, multi-instrumentalist Clement and others spotlight both the tasty arrangements and the understated elegance of the vocals. Americana fans can snag this one locally or online at www.ohboy.com. Talk to me about wrapping up in a warm blanket on an iced age Iowa day. Warm me up with memories and favorite songs. Tell me that two icons in the music business easing over their wild oats nights into their oatmeal days are going to create an album of standard songs, without one newly written tune ... and we're going to rush out for a copy. Silly me. I opened my copy of "Standard Songs for Average People" with great anxiety, afraid knowing that there wasn't one brand new Prine song on it, fearful that it would rate a deep sigh and be lost in my collection of Prine paraphernalia forever. I listened, dumbfounded and amazed at what I was hearing. 14 songs - hand picked by these masters - "From Pistol Packin' Mama" to "In The Garden" - gunslinging and God - only Prine and Wiseman could take these old, maybe forgotten tunes and breath such new life into them. From the wonderful line art cover to the lines inside, it's a brilliantly sumptuous collection that will blow you away. John Prine and Mac Wiseman should have teamed up sooner, whether it be their songs or someone elses. They are magic together and their choice of songs on Standard and Average are anything but! Prine has gold inside of him and with Wiseman - we can listen to a wealth of their riches. Read the titles and you can see the pattern here, and as each song plays, it just gets better. Mac Wiseman's voice is hearty and the perfect compliment John Prine's wholesome. The magnificent arrangements are backed up by a bevy of talent such as Jack Clement (the instigator of this pairing), Charles Cochran, Lloyd Green, Jamie Hartford, Dave Jacques, Kenny Malone, Pat McLaughlin, Jason Wilber, Joey Miskulin, Stuart Duncan, David Ferguson, the Carol Lee Singers, Lester Armistead, Kennith Blevins, Mike Bub, Ronnie McCoury, Tim O'Brien, Pat McInerney, and Roger Cook. Whew! How's that for a band! It's a beautiful, let me say that again, beautiful album... with some high and lonesome, every stringed instrument imaginable, percussion and back up singers. This one won't get lost on your music shelf and a sure winner from these musical geniuses who have made each songs their very own. When Oh Boy Records posts the Standard and Average music clips ... you'll play it once, and then again and again. Perfect for the collector, or bluegrass, folk, country, gospel, crooning fan - It will stay in your player and play in your head for years to come. Street Date April 24, 2007 from Oh Boy Records. Nashville, TN - When two titans of industry join forces, the results can be groundbreaking. If that industry is the music industry, and the titans are legendary songwriter John Prine and bluegrass genius Mac Wiseman, the results are groundbreaking, breathtaking and heartwarming. Prine and Wiseman joined forces to release Standard Songs for Average People, a duets album of classic American songs. It's an album so full of charm and humanity only John Prine would have the courage to record it. It releases April 24th on Prine's Oh Boy Record label. Concurrently, Oh Boy is partnering with Shout! Factory to release the new Live On Soundstage 1980 DVD. The genesis of the album came from an unlikely source - songwriter and producer Cowboy Jack Clement. He suggested Prine sing with Wiseman several years ago. Prine eventually contacted Wiseman, and the two spent time talking about music. It went so well they decided to each make a list of songs they'd like to record with no parameters on style, genre or age. When they reunited to compare lists, they were amazed to discover there were seven songs in common on their lists. It was all the impetus they needed to record a full on duets album. Standard Songs for Average People is filled with great American songs; some well known, some less so. Each track on the record, however, shares an innate humanity and emotional directness that binds them together into a poignant thematic collection. Prine and Wiseman put their own stamp on Lefty Frizzell's hit “Saginaw Michigan,” and Tom T. Hall's beloved “Old Dogs, Children and Watermelon Wine.” Other standouts include Kris Kristofferson's “Just the Other Side of Nowhere” and the old standard “Where the Blue of the Night,” made famous by Bing Crosby. The album comes as Prine is hitting a creative and commercial peak. He picked up his second Grammy Award for his previous studio album, Fair & Square, and recently crossed the million sales mark for albums sold on Oh Boy Records, the label he co-owns with longtime manager Al Bunetta. Prine is in a collaborative mood these days. He and Oh Boy have teamed up with Shout! Factory, a multi-platform integrated entertainment company that focuses on audio music catalog development and home video/DVD projects. They've joined forces to release, John Prine Live at Soundstage 1980, a DVD that captures Prine's celebrated concert for the PBS show Soundstage. The DVD also features interviews with Prine as he tours his childhood hometown of Maywood, Illinois. The DVD releases March 27, 2007, but preorders are available now at www.musicfansdirect.com. When two titans of industry join forces, the results can be groundbreaking. If that industry is the music industry, and the titans are legendary songwriter John Prine and bluegrass genius Mac Wiseman, the results are groundbreaking, breathtaking and heartwarming. Prine and Wiseman joined forces to release Standard Songs for Average People, a duets album of classic American songs. It's an album so full of charm and humanity only John Prine would have the courage to record it. It releases April 24th on Prine's Oh Boy Record label. Concurrently, Oh Boy is partnering with Shout! Factory to release the new Live On Soundstage 1980 DVD. Maywood, IL. (Top40 Charts/ Oh Boy Records) - When two titans of industry join forces, the results can be groundbreaking. If that industry is the music industry, and the titans are legendary songwriter John Prine and bluegrass genius Mac Wiseman, the results are groundbreaking, breathtaking and heartwarming. Prine and Wiseman joined forces to release, Standard Songs for Average People, a duets album of classic American songs. It's an album so full of charm and humanity only John Prine would have the courage to record it. It releases April 24th on Prine's Oh Boy Record label. Concurrently, Oh Boy is partnering with Shout! Factory to release the new Live On Soundstage 1980 DVD. impetus they needed to record a full on duets album. John Prine's newest album for Oh Boy Records, is a wonderful compilation of old Country standards. The best part is that it is a duet album with Mac Wiseman where they sing alternate parts, and occasionally together. They're both always on each song. There's lots of steel on this one and the project includes the great Stuart Duncan on fiddle, Kenny Malone on drums, Charles Cochran on keyboards and a cast of "several others". They sing beautifully together, with a sound that only comes with age and maturity. For his next effort, due out in April, Prine has joined forces with country/bluegrass poobah Mac Wiseman for an album's worth of classic-country covers, including Lefty Frizzell's "Saginaw, Michigan''; Charlie Feathers' "I Forgot to Remember to Forget''; Ernest Tubbs' "Blue-Eyed Elaine''; Leon Payne's "I Love You Because''; and Al Dexter's "Pistol-Packin' Mama.'' -- What's ironic about this project is that, while Prine is one of the finest, and most revered, songwriters in popular music, this will be his third album of covers in the last eight years, while he's only released one album of originals during that period. -- That's OK, though. He's already crafted so many classics of his own - from "Sam Stone,'' "Hello In There'' and "Paradise'' to "Angel of Montgomery, " "Souvenirs'' and "Living in the Future'' - that his songbook still stands head and shoulders above that of most writers.